Did you know that satellites had a role in forecasting the path of Hurricane Sandy almost a week in advance of the storm impacting the northeast United States? Some interesting information about what goes in to making an accurate storm forecast by Dr. Jeff Masters. The image (below) shows the difference between the European forecast agency’s computer forecast model’s prediction of where Hurricane Sandy would be located with satellite data inputs into the model (left) versus the predicted location without the satellite data added (right). 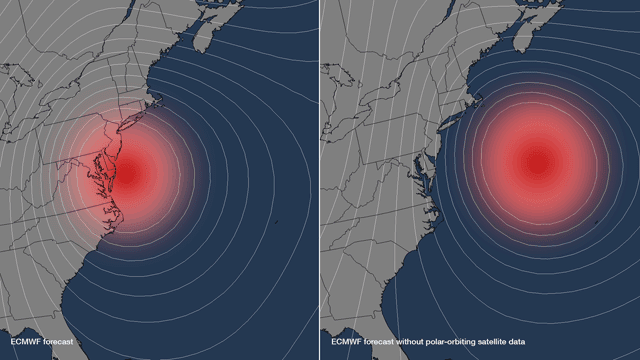 Without the satellite data included in the model run, residents along the northeast coast would have had less warning of the impending storm. I recommend reading the blog post. You hear me reference the European forecast agency’s computer forecast model quite a lot. There is a reason… I have a lot of trust in the model. The agency puts a tremendous amount of effort ingesting a lot of current weather data in to the model and the work makes for a more accurate computer model. Thanks to KMOV’s Steve Templeton for spotting the article and passing it along.